Exclusively made for Medallion shop China. Price range 993.00 – 1030.00 euro, inclusive of lasted shoe tree. For special models, ie. boot and special patterns price can be different. Welcome to the Titanus footwear section. Meccariello’s Titanus line is intended to better accommodate customers’ requests. In collaboration with our friends at Medallion we are able to collect clients’ individual requests and transform it into reality. Therefore providing a unique experience and a better, and more personalized service. In fact the Titanus footwear line is created by transforming clients’ requests into reality. The models lasts and shape are specifically studied to optimize comfort and wear. With the help of our friends at Medallion we were able to create new, market specific, models to better accommodate customers’ requirements. Titanus footwear line fully represents our innovative techniques potential in our Ready to Wear department. In fact it is the epitome of Meccariello’s Ready to Wear line in terms of quality, production time, and finishing. 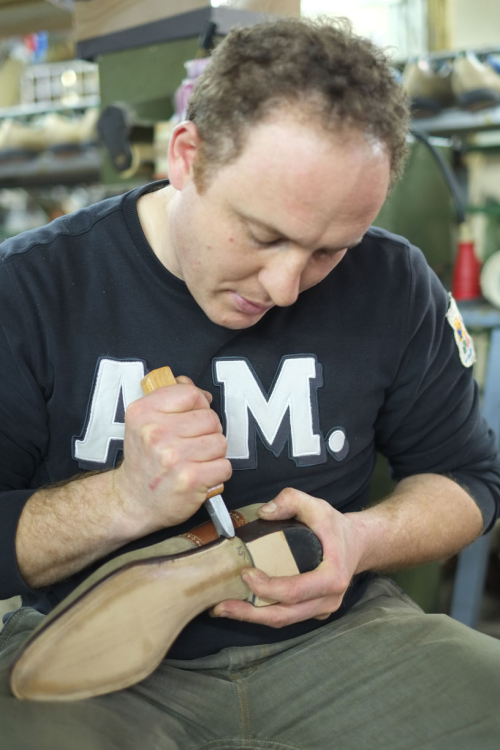 Titanus shoes are sold exclusively with lasted shoetrees to ensure original shape is preserved (not sold separately unless specially requested). We believe in the importance of not altering the original shape by using generic shoetrees. Here you will find all the technical details and differences between the Titanus shoe line, available through our retailers and the ARGENTUM Ready to Wear shoe line, which is marketed by us. Titanus line for Medallio’s store China is made using the handmade traditional sewing technique. However, Titanus and ARGENTUM Ready To Wear shoes have specific features that differentiate them . Most definitely Titanus processing is more involved. Titanus superior quality is made with higher end materials which amount to a 25% increase in cost and requires 30% more time to complete. Some models in specific have been developed in accordance with Medallion’s CEO, Mr. Kevin. Therefore these models are exclusive to Medallion store in China. In addition, Ready to Wear Argentum models can be adapted to specific lasts upon request, exclusively for Medallion. 2) The Titanus shoe line includes both custom models (created on a specific order or request from Medallion ) and models included in our MTO shoe line, available immediately, no mandatory wait time required (usually about 18 to 20 weeks). As in the production of most high-class footwear, we only use the central part of the calfskin ( the one that goes from rump to belly). 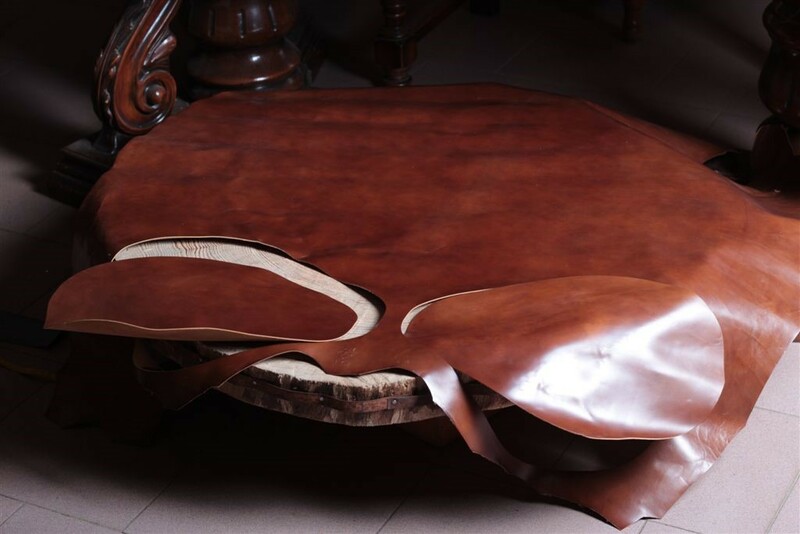 However, given the size of the leather and the type of tanning, only a few pieces can be obtained from each calfskin. The following picture provides an example of an Aurum seamless wholecut . Made in one piece of leather. 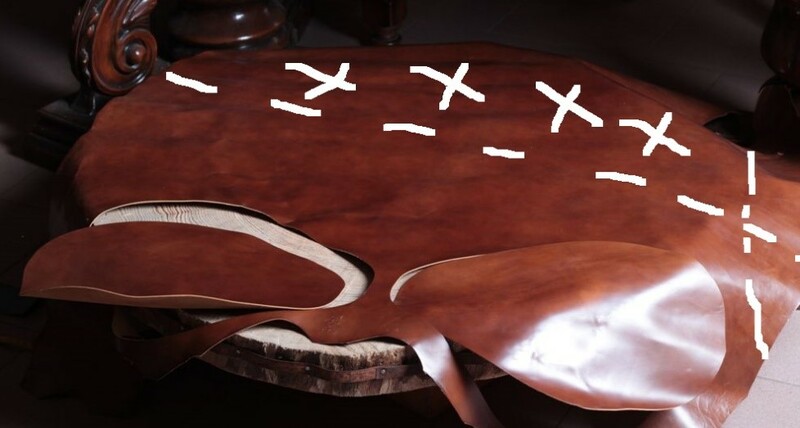 If the shoes present even the smallest hidden imperfection or if the model does not conform to our quality standards, the process is carried out again using a new piece of calfskin leather. All cuts are performed along the backbone line of the calfskin to ensure perfect symmetry both in cutting and esthetic. The white line in the photo represents “the quality zone”, the limit that is never exceeded in cutting the uppers. The X represents the portion of skin that is never used to make the uppers. This part of the calfskin however, is used for the production of prototype samples and test models. Titanus high end material selection is not limited to the best box calf leathers but also vintage and limited quantity leathers. The extreme care used in material selection makes Titanus a high end and exclusive footwear line. Compared to Argentum, Titanus requires on average a 20% increase in production time to allow attention to fine details. The result is a very appealing shoe with lines similar to bespoke footwear and finished with blind welt waist. Shoe waist can be round or square as requested by Medallion. 6) Titanus uniqueness lies in the specific selection of its lasts which are made exclusively for Medallion, such as Chisel3 and Chisel-Medallion, for example, which were designed and produced in order to accommodate the customers’ requests provided to us by Medallion. The following are the models made exclusively for Medallion and include also some exclusive lasts for the shop. These are the guidelines of our production process made according to customers or retailers request. It would also be possible to request a square waist instead of a round waist for Titanus footwear due to seasonal adaptations or esthetic changes, without affecting the premium quality and attention to details typical of all our products. Any type of alteration such as choosing to apply a half sole, metal toe tips, rubber sole etc. is carried out according to the specific requirements of retailers and their customers and does not in any way affect the quality of the final product guaranteed by the use of excellent raw material from our Italian, French and German tanneries. In order to improve the quality, Calzoleria Meccariello reserves the right to make changes to the products shown here at any time. It also reserves the right to make all the necessary technical modifications in order to improve the final product, at any time without prior notice, with the sole purpose of providing a better quality service thanks to any technical improvements that over time may be available, aware that our consumers believe in our willingness to give our best providing the best service and our ability in making premium shoes attractive for retailers and customers alike.